Sporting a new-and-improved processor powering a vast library of streaming content, the Roku 2 - like a fine wine - only gets better with age. The Roku 2 has always been - and always will be - the middle child of the Roku family. At $69 (£59, about AU$90), it's pricier than the Roku or Roku Streaming Stick, but comes in well under the cost of a $99 (£79, about AU$129) Roku 3. Likewise, it has more features and a landslide of better specs than its predecessor, the original Roku, but it's not quite as feature rich as its video game-ready older brother, the Roku 3. But herein lies the magic of the middle child. By cutting out some of the features you may not want or need (e.g. a headphone jack or gaming functionality), you save money while keeping the things that matter, like a faster processor and plenty of ports. It's hard to say anything bad about the refreshed 2015 Roku 2. While I was left struggling with a few nagging issues, the puck-shaped streamer kept impressing me long after the first set of credits rolled. Externally, little has changed about the Roku 2. It's still a small, hockey puck-shaped box and has one tiny, but incredibly iconic, purple tag. Like the Roku 3, it has one side USB 2.0 port and four essential slots on the back for Ethernet, HDMI, microSD and power. The unit itself is slightly larger than the palm of your hand but is far from unsightly. At 3.5 x 3.5 x 1 inches or 88.9 x 88.9 x 25.4mm (W x D x H), it sits so low to the entertainment center it completely blends in with its surroundings. The Roku 2 also has integrated dual-band Wi-Fi (a/b/g/n compatible). However, the wired Ethernet option is hands-down the best choice when it comes to streaming. The microSD card slot, a carryover from earlier models, allows you to store excess channels, and comes in handy after you fill up the internal storage. It's also worth noting that the Roku 2 doesn't have an actual "off" button. The player stays online (consuming less than 3.5w) and updates itself automatically. 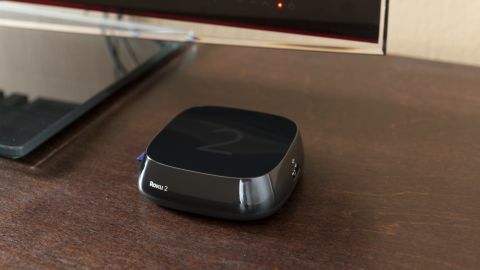 So then what exactly makes the re-designed Roku 2, well, redesigned? Roku made two changes to this year's model: one good, one bad. The good is a markedly improved processor - the same kind that's inside the Roku 3. I'll touch on this more in a minute and while the change isn't an external one, it vastly improves the overall product. The bad news is that the remote we loved from the original Roku 2 - the one with a headphone jack - is gone. It's been replaced with a plasticky feeling replica that's practical, but far from premium. It's also worth noting that two of the buttons from the Roku 2's remote, Blockbuster and MGo, have been replaced with Sling TV and Rdio. Getting the Roku 2 ready is unbelievably easy. Plug the unit into the wall, run an HDMI cable to your TV and voila! You're well on your way to watching the latest season of House of Cards. First-time users will need to create an account on Roku's website, while veteran Rokuites will simply need to add the unit to their accounts via a short identification number. While the whole setup takes a matter of minutes, you'll need to provide Roku with a credit card - in case of any additional fees - and you won't be able to use your new streamer until it receives a short firmware update. A bummer, I know. Easily its biggest strength, the Roku 2 is an equal opportunity player. Netflix, Amazon, MGo, Google Play Store are on equal ground here; Roku makes it clear that it's content first, platforms second. Roku has over 2,000 channels available to download with varying degrees of paid content, interesting shows and specificity. If you're looking for a film noir alien channel or an ultra-specific '90s country metal hybrid station, Roku's storefront is the place to find it. Of course, while there are plenty of niche channels to pick from, the streaming staples are front and center. In the US, that includes Amazon Instant Video, Netflix, HBO Go, Google Play Store, Vimeo, DailyMotion and CBS Access. Folks in the UK will see Sky's Now TV platform (Sky being a shareholder in Roku), the ubiquitous Netflix, BBC iPlayer, ITV, 4oD and Demand 5 as some of the most highly downloaded channels. Audio apps of note in both territories include Spotify, Rdio, Tunein and Vevo. The amount of content available on Roku's boxes is vast, and while the majority of the options are either too oddly niche to be concerned with or poor ports of YouTube channels, the additional options don't detract from the experience. Plus, the ability to customize the contents and order of your home screen means you only ever have to see the channels you want to see.